There are communities of Pennsylvania Dutch living in many parts of the United States and Canada today, but the largest settlement is in Pennsylvania, concentrated in and around Lancaster County. The best way to get a glimpse into the Pennsylvania Dutch community's unique way of life is to visit the area. The Pennsylvania Dutch (also called Pennsylvania Germans or Pennsylvania Deutsch) are descendants of early German immigrants to Pennsylvania. They are made up of a range of religious groups including Amish, Mennonite-Lutheran, German Reformed, Moravian, and others. These groups share some beliefs—many revolving around a conservative life—while differing in others. The Pennsylvania Dutch population arrived in droves between the late 1600s and the early 1800s to escape religious persecution in Europe. Like so many other persecuted groups, they were drawn in by William Penn’s promise of religious freedom in his new land of Pennsylvania.​ Most Pennsylvania Dutch still speak a variation of their original German language as well as English. Most Pennsylvania Dutch wear traditional clothing that is unadorned and often made by hand. Women usually wear dresses or skirts, while men typically wear simple suits or trousers and buttoned shirts. But specific rules regarding wardrobe vary per sect. For instance, the Amish do not wear jewelry—not even wedding bands. Unmarried men are usually clean-shaven while married men have beards. The Amish are generally averse to anything that could chip away at the family or close-knit community structure, which is of the highest importance. This includes most modern technology, as well as education beyond the eighth grade, which they feel can lead to unnecessary egoism and separation. 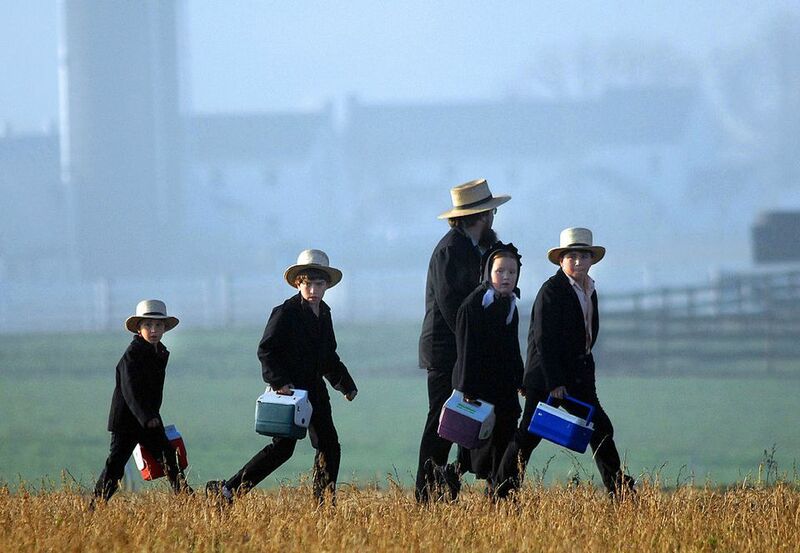 Mennonites hold many of the same beliefs but tend to be somewhat less conservative in dress codes and in the use of technology. Different groups follow different rules, so it's best not to generalize. The sects of the Pennsylvania Dutch vary from strict followers of the Old Order who adhere to a simple, traditional lifestyle to more contemporary groups who have allowed certain aspects of modernity into their lives. Some do not use battery-powered electronics, while others now use cell phones. Some do not allow phones in their home but have them in their place of business, as they can be essential to making a living. Each sect has its own rules ranging from guidelines for dress and hair length to buggy styles and farming techniques. It is unusual in the United States for people and culture to be the primary tourist draw of a destination, but many visitors to Lancaster County come to experience life in "Amish Country" and witness a lifestyle so vastly different than their own. Observing a culture free from most modern technology offers a window into the past. While many local Pennsylvania Dutch welcome and have come to rely on the tourist industry for their livelihood, giving demonstrations or selling handmade goods like furniture or food from their farms, it is important to also be respectful of their privacy. Remember that they are real people going about their daily lives. It is important for all visitors to know that among their many unique beliefs, most Pennsylvania Dutch do not believe in having their photograph taken, as they believe it is a sign of vanity. You’ll learn about their way of life through observation as well as the many museums and sites dedicated to preserving local culture. Most Pennsylvania Dutch tour guides are very open and willing to answer any questions. Many constantly have to reassess their beliefs and choose what to incorporate from the modern world without sacrificing their core values. Times have changed, and continue to change, for the Pennsylvania Dutch, if at a much slower pace than for the rest of the world. How Did the Liberty Bell Get Its Iconic Crack?